Many people want hardwood floors in their basement, until they hear the horror of that idea. Hardwood floors are not made to be used as basement flooring. If you are dead set to have the look of wood flooring in your basement, there are options that will blow your mind with how much they look exactly like hardwood floors! 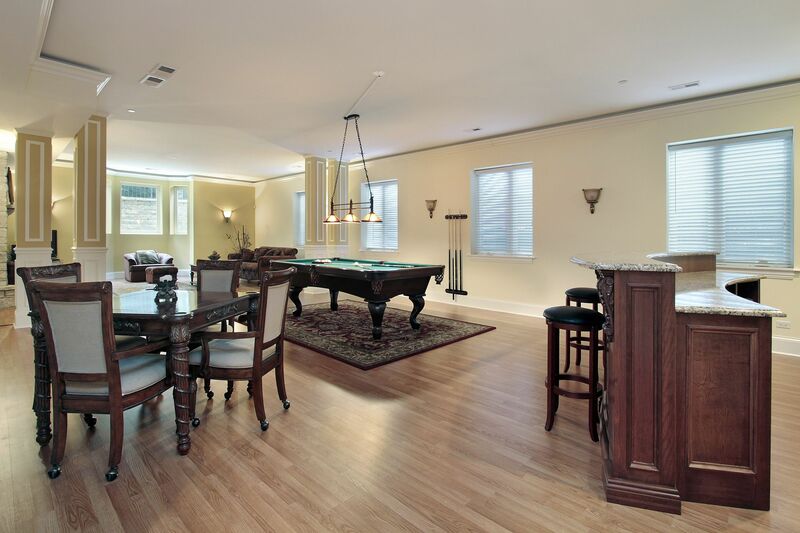 Yes, it is possible to put hardwood floors into a finished basement. But, it’s definitely not recommended. Water and moisture can severely damage the beautiful floors you spent a good amount of money on. Don’t you worry though, there are great options that look just as gorgeous as hardwood floors! 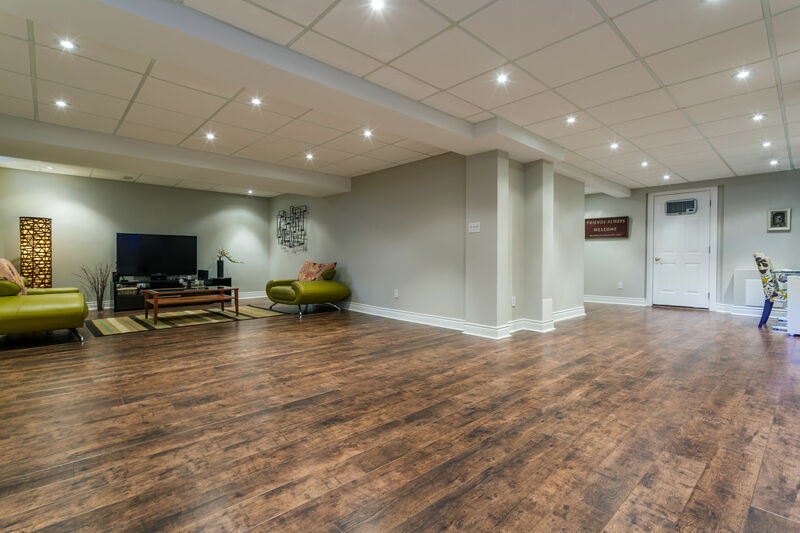 Both hardwood flooring and engineered wood flooring are made out from real wood, but there is a big difference to consider when picking out basement flooring. So, what’s the difference between hardwood floors and engineered wood floors? Engineered wood floors are a lot less expensive and are easier to install. Hardwood floors are solid planks of wood. Engineered wood is different layers of hardwood, plywood, and the top layer is a hardwood veneer wear layer. Hardwood is not suitable for basement flooring because the moisture will expand and contract them. While engineered hard wood floors include more resistances to moisture, making them great for basement floors. Engineered wood looks just like hard wood. But it stands up better to the environment in a basement! Shaw goes into greater detail about the differences of hardwood flooring and engineered wood flooring here! Want the same look as hard wood floors but don’t want to do the work it takes to maintain them? Then porcelain wood tile is for you! If your someone who is just in love with the real look hardwood floors have, trust me. This stuff looks like real wood! It’s pretty mind blowing. Designers say these wood looking tiles are the most popular flooring in 2017. One of the major benefits of porcelain tile is that its very affordable. As you know, hardwood floors are far from affordable for most. Porcelain tile stands up so well to water and moisture, they are even used in showers. Making it the perfect flooring for the basement! This quality material is also extremely easy to clean. To all the mom’s and dad’s out there, you will want this in every room in your house! Waterproof flooring with a beautiful wood look! Yet another great option when wanting a warm wood style in your basement. Do make sure that you are shopping for waterproof laminate. Regular laminate will not hold up to moisture and potential leaks in basements. This is another flooring that is a dream for parents and pet owners. They are extremely easy to clean! You’re right, nothing can take away the true beauty and warmth real hard wood flooring brings to a home. If you are all about having hard wood floors all over your home, my suggestion would be to have them in every room except the basement and bathroom.